This might be the coolest and most functional flashligh we have ever seen! At Shop Geocaching, we are always on the lookout for products that seem to be a fit for this game that we all love to play. We are excited to have found that in the HybridLight Flashlight/Charger! 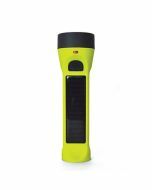 It is an incredibly bright flashlight, can fast charge OR solar charge, it can charge your phone, has magents on the bottom and a rotating head, can hold a charge for years and give light all day, and some how knows where Geocaches are even if the coordinates are off! This thing might be amazing! Water resistent, extremely durable and can hold a charge for years! Measures 9 inches in length and 8.5 oz.